If you ever thought there aren't too many adventure sports options in Karnataka to indulge in, you're mistaken. From 10000 ft up in the air to few hundred feet under the ocean, most of the adventure sports options are indeed available in Karnataka-one state, many worlds. Below is a quick compilation of 10 different adventure activity you can try without having to step out of Karnataka state. Key notes: You should not weigh more than 85kgs, should be healthy individual with health certificate. Microlight flying involves going up in a small two seater plane to about 1000 ft and then getting to control the aircraft a bit. A trained pilot would take you up and teach you basic maneuvering. Good way to learn basics of aviation and experience flying first hand, without having to spend a fortune. Conducted by Bangalore Aerosports at Bangalore (Jakkur airfield), Mysore (Mysore airport). Costs 5k for a 30 min sortie, can be cheaper if you try through websites like groupon. More serious folks can try their training program and apply for microlight pilot license. If you have 30 lakhs to spare, you can buy a microlight plane itself (instead of a BMW may be) and fly to work (isn't that cool)? From 1000s of ft above in the air, now deep into ocean-Karnataka has it all. Diving into the ocean and experiencing marine life on sea bed first hand-can be tried at Netrani Island, Murudeshwara, located in coastal Karnataka some 100kms north of Udupi. You can try a quick dive or take 2-3 days training session, costs close to 5k onwards. Don't expect the view to be as beautiful as those shown in National Geographic though. 4. White water Rafting in Kali river: Kali river near Dandeli is the best place in Karnataka to try white water rafting. Nov-Feb is the best season. Costs Rs 1400 per person per ride as of now. Rafting can also be tried at Dubare near Coorg, Sita river near Udupi and at few Jungle lodges resort located on bank of Kaveri river, subject to good water levels, but Kali would be the best place to try this. We tried it this Jan but unfortunately no photos. 5. Rock Climbing at Ramanagara: Ramanagara near Bangalore is a great place to try rock climbing. Organizers like Mars adventures can conduct one for you if you have a group. A much milder variant of rock climbing can be tried on artificial walls available at many facilities, such as one off Sarjapur road, Bangalore. There’re two major spots in Karnataka where you can explore caves- one is Antaragange near Kolar [details here]and other one near Ulavi, Karwar (yet to explore this). Go with a guide or organizer and you’ll get to explore the giant rocks in details. It is a great exercise to be able to pull yourself up in between two giant rocks separated by a space less than half a meter, or watch gigantic rocks standing on tiny balance. Involves going up in the air, while being pulled by a boat (or jeep, in case of inland locations). In Karnataka, you can try para sailing in St Mary's island, Malpe (near Udupi) and Gokarna near Karwar. Costs about 1000 Rs per ride, depending on season, duration and other factors. 8. Jetski Ride Available again in Murudeshwara and Malpe, you can drive the jetski with a driver behind you. You can’t do any stunts as shown in movies, but a quick round splashing on the waves will be quite refreshing. A short trip can be had for about 300 Rs, again depends on season, duration and your bargaining ability. Expect these facilties to come to more and more beaches. 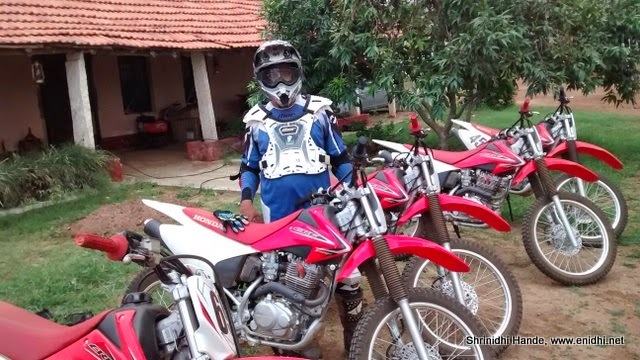 Even otherwise, off-roading can be tried at various places all around Karnataka- Kodachadri near Kollur, Habbe falls near Chikmagalur and many other hills have off road friendly track. But recommend going in teams or with support and not venture all alone. Trekking is probably the cheapest adventure you can have. Top it up with overnight camping on top a hill and the experience will be highly memorable. Karnataka offers great trekking trails- Yana near Kumta, Bisile near Subramanya, Sakaleshpura near Hasana, Ombattu Gudda, Mullayyanagiri near Chikamagalur, Skandagiri near Bangalore are some of the popular trekking destinations. Join an adventure group or trekking club who organize frequent trekking expeditions to enjoy nice trekking experience. Unfortunately I am yet to trek most of the popular hills in Karnataka. Most of my trekking has been around Chennai- on hills in Tamilnadu/AP border. Trekking to Doodhsagar falls on Karnataka-Goa border is another must do. I am skipping activities like rope walking andboat rides. Some of the adventures like hot air balloon ride is still not available in Karnataka and of course, lots of snow mountain based activities can’t be tried here. But above list should be good enough to kick start the adventurer in you and make you go out and explore. So this holiday season, try something different. Interesting list of adventure activities. They would have said so because of the distance. If you get the train, walking distance would reduce dramatically, else you'll have to trek about 11kms I guess. If you're fine walking that much (many regular trekkers do), then you can go any time. Probably you appeared like a regular tourist, hence they would have recommended taking train.